I’ve been seeing so many examples of God’s perfect timing recently! Some were things that seemed a disaster at the time, but looking back I can see the way God worked it for the good. Others are more obviously “God is amazing!” good right away. This latest one took something I’d been a little frustrated over waiting many months for, and turned it into something perfect – an immediate oh-wow God thing! There’s no such thing as coincidences for believers. They are always God at work in our lives. I’d been working on a story for a new boxed set that’s due to release June 30th, and having a great time with it. I chose the one about the princess doctor who has to leave America to go home, marry her teenage sweetheart and so save her country from chaos. Half-way through, I loved the story, but didn’t want to rush it. Between the deadline for the boxed set and the time my editor needed for her two rounds of edits, it had to be finished by the end of the week. Eep! That was sooooooo not going to happen. Besides, though I love getting together with my favorite authors in boxed sets, I really wanted to release this story on its own. I prayed, and it seemed I had no other option that a week of all-nighters to get the draft complete and put it in the set. No time to switch to one of my other incomplete stories, and no time for the usual rounds of self-editing I do before my editor sees the story. Then God gave me an amazing gift. In a wonderful reminder of His perfect timing, He gave me back a complete, publish-ready story, just when I needed one! The story I’d resubmitted to Love Inspired last year came back to me with the perfect sort of rejection – she loved my writing, wanted to see the full manuscript of any other stories I wanted to send her, but this story just wasn’t the best fit for the line. I have never, ever, been so happy to have a story rejected! I may have even squealed and shouted “YES!!!! !” when I read the email. This could be my story for the set. It had already been through a zillion round of edits and revisions, and proofread before I submitted it. All I needed to do was another proofread, format it, and make a cover. My red-haired princess could go back in the story queue to become an August release. God blessed me with exactly what I needed, exactly when I needed it! The funny thing is, God’s perfect timing is one of the themes of my story, too. 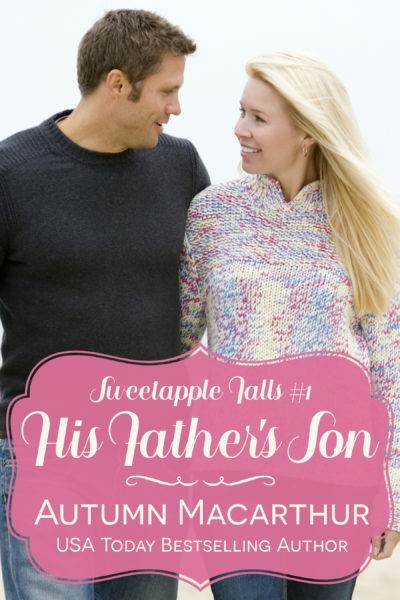 When former bad boy Luke Tanner discovers the son he believed was adopted is fatherless, he’s determined to help — and regain the trust of the only woman he’s ever loved. For small-town single mom Anna Harrison, his return is twelve years too late. Luke broke her heart when he left. She can’t risk that for their son, disabled by a life-limiting illness. But she can’t deny Josh the father he wants so badly, either. To become the loving family Luke hopes they can be, they’ll both need to forgive secrets from his troubled and painful past. Can they leave old hurts behind to face the future together with God’s help, or will only a crisis heal their stubborn hearts? God brings Luke home when Anna and their son Jacob need him most, and also when they were both mature enough to work at creating a committed relationship. I love the way this couple finally allow Him to heal their past traumas and deep-buried hurts so they can commit to a lifetime together. I read it again as I proofread and formatted it earlier this week, and the last few chapters still made me cry! I can show you the covers for my book and the set, but no links yet as the set doesn’t release for another month. 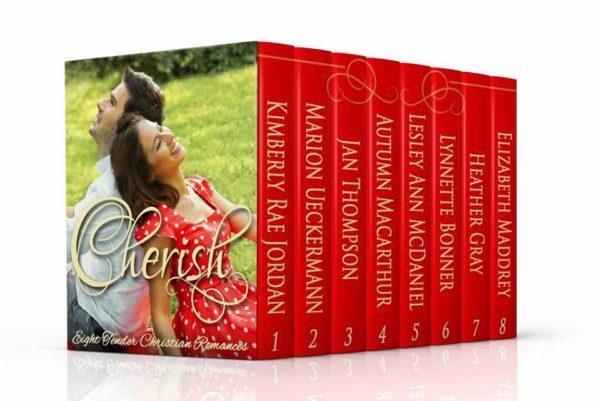 To be notified when the set launches (with a 99c release week price! ), why not sign up for my newsletter, or follow me on either Amazon or BookBub? Coincidence, or God thing? Come discuss with @autummacarthur at Inspy Romance today! Anyone want to share the most amazing God-thing they’ve experienced? One comment chosen at random from all comments made before June 7th will win a pre-release ebook copy of His Father’s Son. Hi Autumn. What a great story, thanks for sharing. It is so important to share and be reminded of God’s timing and His perfect leading, too often it is easier to focus on the negative. This time last year, my husband and I firmly believed we would be in another country, hubby had been offered a great position overseas, and we were excited about the possibilities that could come from it. In the end it did not happen, and we weren’t sure why. Now, we totally know, and are so thankful that we remained where we are, with the medical care available for our oldest son, along with the incredible work and love our sons teachers are putting into them. God is good, we just need to take the time to reflect, remember and share to see His leading. This and some of the other things lately have been such a good reminder for me to trust God and know He has a better plan, even with things that were difficult at the time. I’m hoping when more difficulties hit, I can be more patient and trusting next time! Congratulations on your “rejection” Autumn! Although it’s not always easy for those of us who can be impatient, God’s timing is always perfect and we should never doubt that. LOVE this! God is sooo good!!! Our daughter callled us once crying because, although she faithfully paid her rent, her roommate kept the money and spent it herself. They were evicted, and the roommate disappeared (later we found she just went home). We were 5 hours away, so we hurried to get there, praying all the way. Our daughter ended up in an apartment that we had tried to get for her earlier but it wasn’t available then. It ended up being the best place she stayed! If she had gotten it first, she would have still had a roommate (who probably wouldn’t have paid the rent). And this apartment was everything we had prayed for! So glad that worked out well, Becky! 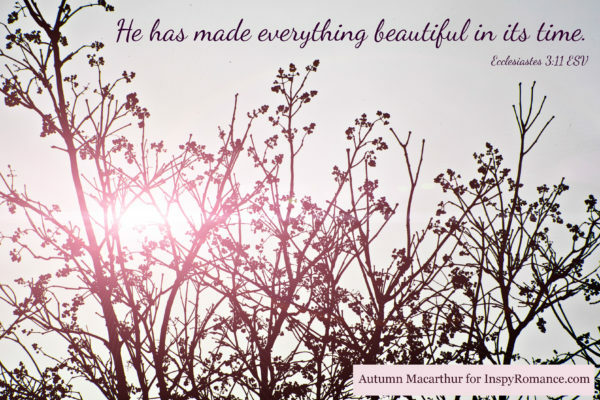 Mine was just a little example, but when we look, we see God’s goodness in everything. Even messy and wrong human freewill choices, He can bring good from. I’m grateful for the reminder to trust and wait on His timing. It’s a wonderful thing when we get those moments! Praying we all get more of them! God’s timing is always perfect. Thanks for sharing your story. Thanks Rachael! It should be a lovely set. Great testimony! Looking forward to all your stories. It seems backwards to congratulate you on a rejection, but yay! Isn’t that like God? Taking the backwards and making it a blessing. I don’t think you’re the only one with that old bad habit, Kimberly! I’m hoping I can remember these lessons God is teaching me now when I run into more seeming roadblocks and frustrations again! God’s timing is always perfect though it’s hard sometimes when we don’t get what we think we need. I dated two different guys and would have married either one if they’d asked. What a mistake that would have been when I see them now. I got a wonderful man and we’ve been married almost 36 years! Oops, my reply to you attached to the wrong comment, so I’ll comment again! I love your example, Gail! Such a good one. My husband and I have faced some challenges in our marriage, but through it all I knew I was where God wanted me. Only now so many years later am I recognising some of the reasons why. And that’s a great saying! YES YES His timing is always perfect! Love your post, Autumn! Thanks for reading, Jackie! I’m glad you’re here! So happy you got the rejection letter just in time for you to submit that one for the box set! I’m looking forward to the August release to as I happen to love princess/prince type (royalty) books. In thinking back, and God thing for us, was Him getting us out of a legalistic church. We have since found a good one, but it took about 5 years to even consider actually joining a church body again, aside from visiting here and there. So glad you found a better church, Andrea! Just recently God opened the door for us to purchase our home after 3-4 years of trying to. Not only did the doors open, but things moved MUCH more quickly than we anticipated, closing 2 weeks earlier than expected. When God moves….HE MOVES! I’m just so in awe of how God works His perfect plan in our lives & in unexpected ways! Squeee! That is so exciting, Trixi! God is so truly amazing. What a great story and exciting (book’s) storyline. My husband and I just spent 3 months trying to negotiate to buy an apartment with a very unreasonable person. (We had been looking for a place for two years and finally thought we’d found it.). It was very frustrating and we’ve been praying for God to show us if he didn’t want us to buy it. We actually looked at other places during the negotiating period and always got back thinking: the place we’re hoping to buy is worth the hassle… until 3 weeks ago. We finally found a place to call our own. So we’re kind of grateful for the unreasonable seller who helped us stay looking long enough to find a better place. It is a bit smaller but has a wonderful garden for our son to play, which the other one didn’t have. We can see it was God’s timing not ours. I’m now finding that whenever I hit delays or frustrations – there’s a reason for it that I can’t see till later. Hoping seeing God’s plan working out through past frustrating delays will help me be more patient with the current ones! I’m having the same kind of hope now as I’m finding sone professional road blocks. There is one narrow door opened and I really want to go through but can I? Should I? Will I? It will definitely take a lot of effort to even try. Praying you sense some clear guidance on that one! It can be tricky when challenges and apparent roadblocks aren’t necessarily a “No”! Autumn, what an amazing story! Thank you so much for sharing! Yes, God’s timing is perfect. Always. And the blurb for your new books is beautiful. Thank you, Alexa! This was my first ever completed Christian romance, when God called me away from writing secular, so it’s a story close to my heart. Your blurbs draw me in. I want to read them all!